My mom made amazing lemon bars. The tangy, melt-in-your-mouth kind, with a buttery shortbread crust. She only made them at Christmas, and stored them in our downstairs freezer. If you wanted one, you had to go down and sort through her Christmas baking stash of chocolate peppermint brownies, thumbprint cookies and other treats, and wait for what seemed like an eternity - maybe 15 minutes - for it to thaw enough to eat. Now, my sweet mother-in-law often makes lemon bars at Christmas - since she knows I associate these with my mom. While I have my mom's recipe, it usually only occurs to me to bake them in December. But with warm weather finally springing up in New York - which also triggers a taste for all things lemon - I decided to whip up a batch today. I often take dessert to our Tuesday night gatherings with friends from church, and decided to switch things up from the usual chocolate chip cookies or cream cheese pound cake I usually take. Also, with Mother's Day this Sunday, it seemed an appropriate time to make them, so here is the recipe. Preheat oven to 350 degrees. Prepare a 9 x 13 baking dish by lightly buttering bottom and sides or lining with parchment paper. Sift flour and powdered sugar together, and cut in butter (I use a pastry cutter) until mixture forms small crumbs. Press into pan, and bake for 25 minutes. For filling, combine eggs, sugar and lemon juice; beat well. Sift flour and baking powder together, and stir into egg mixture. Pour over baked crust, and bake 25 to 30 minutes. Allow to cool for at least an hour. Sprinkle with powdered sugar before cutting and serving. If you try it, please comment below and let me know what you think. Happy baking! In my opinion, peanut butter cookies are one of the world’s most perfect desserts. Not just any peanut butter cookies, but warm, homemade ones fresh from the oven - complete with criss-cross patterns across the top. After years of making them with the usual long list of ingredients, I found an easier way. By using only five ingredients - which you probably have in your kitchen right now - you can go from craving to fresh-baked cookies in less than 15 minutes. I make these for my husband, who adores them, as well as for parties, bridal showers, church gatherings – pretty much anywhere someone asks me to bring dessert. Not only are they scrumptious, but since you don't use flour, they are also gluten-free. Regular creamy or crunchy peanut butters like Jif and Skippy work best here. Natural varieties tend to yield cookies that are crumbly or “spread” excessively when baking. I also prefer using brown sugar, as the cookies are a bit chewier than with regular white sugar. Here is the super-simple recipe! Preheat oven to 350F. Mix all ingredients in bowl. Scoop onto a non-stick cookie sheet or baking sheet covered with parchment paper, and flatten by making crisis-cross patterns with the tines of a fork. Depending on your oven, cookies will be ready in seven to eight minutes. 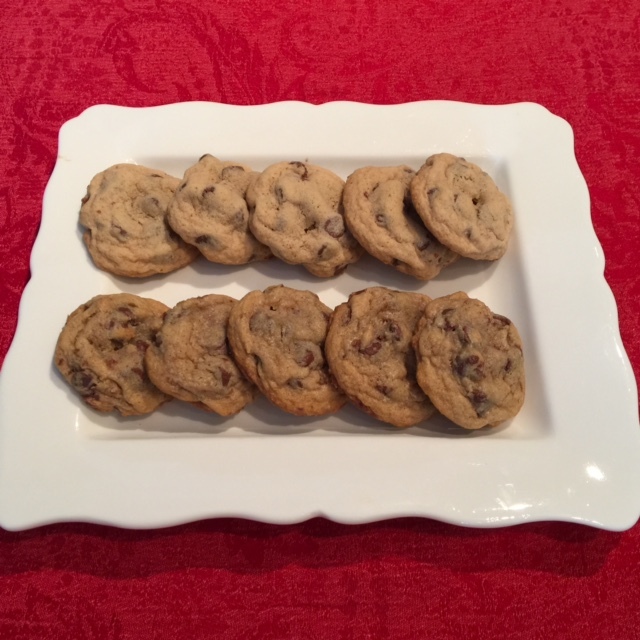 Remove pans from oven about a minute before cookies appear to be “done” or start to brown. Makes about two dozen cookies, depending on size. These are best enjoyed with a glass of ice cold milk. If you try them, please let me know what you think. Happy baking!